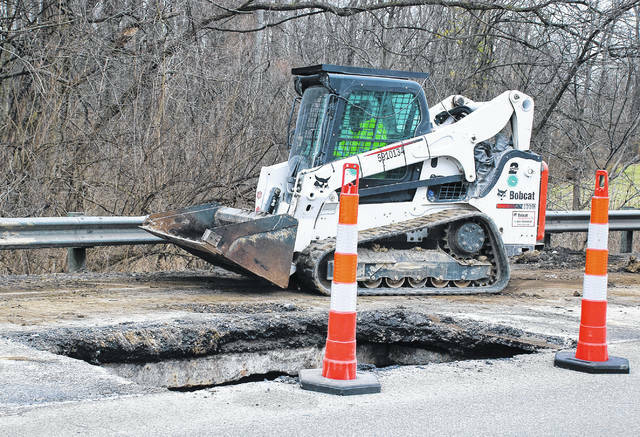 Ohio Department of Transportation District 6 crews worked to repair a sinkhole on southbound U.S. 23 that developed on Wednesday south of the City of Delaware. In order to conduct repairs, ODOT reduced U.S. 23 traffic to a single lane between Hawthorn Boulevard and Meeker Way. U.S. 23 south of the City of Delaware is reduced to one lane of traffic due to a sinkhole that developed on Wednesday. According to a press release from the Ohio Department of Transportation District 6, the affected area of U.S. 23 is a southbound lane between Hawthorn Boulevard and Meeker Way. The lane closure will remain in effect until “at least tomorrow (Friday) night,” according to ODOT spokesperson Nancy Burton. Burton said a crew is making repairs to the area. She said a drainage pipe that carries surface water from the roadway to a culvert off the road apparently failed and water began eroding the soil under U.S. 23. The sinkhole first began as a “dip” in the roadway, approximately 1 1/2 feet deep. ODOT filled the hole, but the repair attempt failed within 30 minutes, Burton said, prompting the lane to be closed and a larger project to be undertaken. Burton said an ODOT crew is filling the ground below the pipe with concrete and other material. She said more work will be conducted at the site on Friday.